Downloading free books to your iPad - iPhone.MY - Daily News On Mac, iPhone, iPads, iPods and more! I travel fairly frequently and when I’m on the road I’m always looking for something new to read. Are there inexpensive book sources other than the iBookstore that are comptible with my iPad? The least expensive one I know (as in “free”) is Project Gutenberg. This is a terrific resource for older books whose copyright have expired in the U.S. Currently Project Gutenberg offers more than 33,000 titles. The iBookstore has some of the same titles offered by Project Gutenberg, but not always for free. For example, my daughter wanted a copy of Jules Verne’s20,000 Leagues Under the Sea. The least expensive edition at the iBookstore was 99 cents. At PG it’s free. 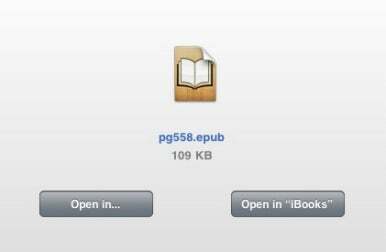 It’s quite easy to download books directly from Project Gutenberg to your iPad. Just launch Mobile Safari, travel to the PG site, locate the book you want to download, click on its link, and choose to download the ePub version of the book. When you do you’ll be offered two choices—Open In or Open in iBooks. Tap the latter option and the book will download and open in iBooks, where it’s now stored as part of your iPad’s book library. This also works with iPhones and iPod touches capable of running iBooks. There’s nothing particularly magical, in a technical sense, about what Project Gutenberg is doing. Rather, the magic is that iOS devices running the current iOS software can now save and load books in the ePub format. Given that, you might want to check other sites that offer free ePub books including MobileRead, epubBooks, and Feedbooks. Facebook 3.2.3 for iPhone – yet more bug fixes!